There's a free introduction to Chirak here you can download which includes maps of the Sea of Chirak region. It's basic and system-neutral, but doesn't provide a lot of specific setting content. There's a revised introduction to Chirak here which I have revised again recently, and provides a more modern (and cleaner) overview of Chirak. The 4E-compatible version of Chirak can be found here as well, but I promise I will have a 5th edition compatible version out before the end of the year!!! I also have an OSR conversion document for Chirak here. 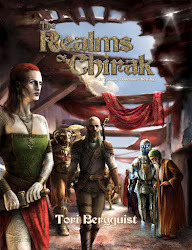 A new introduction to Chirak for the eventual revision that will be 5E compatible. The City-States of Pelegar Entries - Chirak's biggest "crapsack kingdom"
Ancient lore of Eredoth unveiled. This region has a lot of them. An introduction to the regions of Chirak north and east of Xoxtocharit. They make the Xoxtocharit look normal and balanced. A Theliad scenario in 4E terminology I ran some time ago. Still more plots in Kasdalan!